There are many moving parts required to sell something online. At a minimum you’ll need web hosting, a sales funnel builder, and an email service provider to start with. Later on you might want bring in affiliates and perform webinars to bring in more sales. BuilderAll is an affordable platform for building websites and sales funnels. If you like accessing all your tools in one place, then it’s worth taking a look at. Or add a FB messenger chatbot to your site to increase conversions. Getting all these different tools to sync up can be a technical nightmare. BuilderAll bills itself as an all-in-one platform that promises to be the last marketing tool you’ll ever need, at a price you’ll struggle to beat. If you’re ready to buy BuilderAll already, feel free to skip to the end of this review and grab my $17,776.95 BuilderAll bonus package. The BuilderAll platform was created by Erick Salgado, back in 2011. It bills itself as a digital marketing platform. Which is a little bit confusing and vague at first glance. But if you drill down deeper you can see it’s basically a bunch of marketing tools combined together into one platform. The main piece being the builders, which allows you to create landing pages and sales funnels. It also includes MailingBoss which is its own standalone email service. What kind of sales funnels can you create with BuilderAll? Take a look at this Million Dollar Passive Income Challenge funnel that was built by one of the top BuilderAll affiliates: Liam James Kay. This is a great example of a viral affiliate funnel you can create with BuilderAll, which will help you earn affiliate income promoting it. My first experience with BuilderAll was back in June of 2018. I can’t remember where I first heard about it, but I saw it had a potentially lucrative affiliate program, so I decided to check it out. So that’s what I did. I signed up and started playing with it. First of all, the interface was confusing and unintuitive. While I liked the selection of templates they had, the drag and drop was very confusing to use. Honestly, it was just so bad I just gave up and asked for a refund that same day. Fast forward a month, and BuilderAll had a relaunch of their platform. They added a bunch of new features and revamped a bunch of things. I didn’t join back up again right away, since I was more focused on promoting ClickFunnels instead. But a few months later I signed up again for a new account to see what the new BuilderAll was all about. And what I found was that the new BuilderAll was definitely an improvement over the older one. Yes, I think it still suffers a bit from trying to do too much. But I saw a lot of potential to really making money promoting it as an affiliate. It didn’t happen overnight. It took me several months to finally figure out how I would promote BuilderAll successfully. However one day, one of my Facebook friends pointed me to the Million Dollar Passive Income Challenge funnel and told me that it was his most successful and highest converting funnel. But what hooked me was that it was the same funnel used by the top BuilderAll affiliate, Liam James Kay. All I had to do to promote it was give people my link. No setup necessary. And that’s when I decided to seriously start promoting BuilderAll. Part 1: What Are The Best Features of BuilderAll? If having all the tools you need to build your business wasn’t attractive enough, you also have all your hosting needs taken care of as well. So while the monthly cost of BuilderAll doesn’t rival that of most shared hosting plans (such as those from SiteGround), there’s still a nice chunk of savings to be had. BuilderAll also focuses on speed optimization to ensure your website stays ahead of industry standards. Going into this platform for the first time I wasn’t expecting to see such a comprehensive set of tools. Not only do you get your usual site building tools, but you also get funnel tools, email marketing, webinars, video tools, a course platform, SEO tools, social proof tools, analytic tools… and the list goes on. Quite literally a dizzying number of ways to use this thing. I mean, without going into the capability of each tool (more on that soon), this suite covers literally everything you could possibly need as an online business owner. Ahh, this was an interesting find. 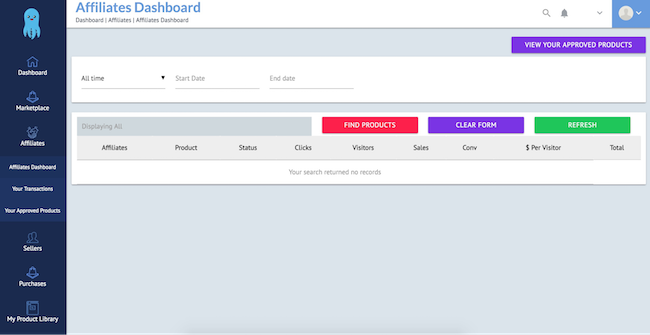 Clicking the bell icon from the dashboard opens up a “Launch Alert” popup with several questions about your upcoming product launch. If you feel this out, you’ll get special attention during your launch period to make sure everything works as expected. Considering how crucial product launches are, this was a very welcome surprise and something I’ve yet to see in similar platforms. If you already went through the trouble of setting up a website, I’ve got some bad news. Unfortunately, to benefit from the BuilderAll ecosystem and have all the tools within the platform work smoothly, you won’t be able to keep your current site. Instead, you’ll have to use BuilderAll’s site builder to rebuild the site from scratch, which could easily be a deal-breaker for some. We’ll be taking a look at the page builder later in this review. While BuilderAll’s dashboard area is a great example of how dashboards should look and feel, the same can’t be said for the individual apps. It’s one thing not having consistency from the main dashboard going into the tools, but the differences are also felt from one tool to the next. It’s not just the visual consistency but also the layout and workflow of these tools that change, which gives these apps a higher learning curve than perhaps is necessary. I’m big advocate of live chat support. It’s so much more efficient than email and other ticket-based systems. Unfortunately, BuilderAll clearly doesn’t feel the same way since they don’t offer live chat support. The first thing you’ll see when logging into BuilderAll is your dashboard. This is where you access the different tools within the platform, and despite dozens of potentially overwhelming tools to choose from, everything was actually very well organized in the sidebar. This right here is key. Being able to find what you need without wading through countless menus or simply guessing is part of what makes a great all-in-one… well, great. While there are a bunch of other tools to mention, the majority of what you’ll use will fit into either of these core categories. The ‘Builder’ module of this platform is a replacement for blog and page builders like Wix, or Elementor. Opening up this section, it’s not entirely clear which of the 4 builders to use when creating your website. This is where I felt tooltips, or some other form of explanation about each tool would have been appropriate. Instead, I found myself jumping into each of the three page builders to get a feel for what they do. Many of the templates look similar in layout, so you may have to do a little more customization in some cases. Clicking ‘Edit’ on any of these designs opens up the page builder where you can make changes. What’s interesting about the builder is that unlike popular WordPress page builders, this truly is drag-and-drop. You can place any element to a specific point on the page just by dragging it with your mouse. As for the rest of the page building experience, It was nice to see features like inline text editing, keyboard shortcuts and granular customization over elements. One thing it doesn’t have is responsive (or mobile) editing, and that’s where the other builders come into play. While this might seem like a reasonable approach, it also means having to recreate the same pages in a responsive builder which is pretty inexcusable — especially when you consider that in 2018, most people browse on mobile. This, for me, is probably the biggest drawback of using BuilderAll’s page builder and I feel combining these tools into a single builder is what’s ultimately needed. Overall, while these aren’t the most sophistic page builders on the market, they still very simple to use and you should have no trouble building a professional looking site using this tool. The email marketing module of this platform—called MailingBoss—is a replacement for tools like Aweber, MailChimp and ConvertKit. This thing gives you up to 10,000 subscribers as part of your plan, and I get the impression it was once a standalone tool since it’s the only BuilderAll app with a branded name. Right away, this one feels more modern than the other BuilderAll tools, and feels completely different to anything I’ve seen so far. Creating a list simple, and the tool takes you through a setup wizard to configure all the usual settings. The final step is to create your welcome email. The email builder was easy to use and provided plenty of professional-looking template blocks to drag into the frame. As for automations, those who’ve over from tools like ConvertKit or ActiveCampaign will hope to see something similar here. But what you’ll really want to get your hands on is the automation workflow builder. This is where you can begin setting up more complex and dynamic automations for each individual subscriber. While all of this is impressive as part of a larger suite, it’s important to know that this isn’t going to compete with mainstream solutions and it isn’t nearly as flexible. What you do get, however, is something that offers you all the typical functionality an online business owner needs. Nothing more, nothing less. Overall, this is possibly the most visually appealing and feature-rich tool I tested from the BuilderAll suite. The ‘Design’ module of this platform gives you tools for creating product mockups, building presentations, and a basic photo editor. This Design Studio tool allows you to create mockups for digital products using things like phone, tablet and desktop displays, as well as boxes, street signs and more. This tool actually reminds me of placeit.net (free), and actually performs just as well at creating product mockups. Honestly, while this gets the job done, most people will probably opt to use PowerPoint, Keynote or even Google Slides (free) instead. Finally we have the photo studio, which is essentially an online photo editor. This clearly isn’t going to replace Photoshop anytime soon, but it’s no doubt useful for standard photo editing. Overall, the design tools offered here are pretty basic, but given the free alternatives available I don’t think these are the kinds of tools an all-in-one platform should be prioritizing. Instead, you get tools to create either animated or floating videos, which are essentially video marketing tools. 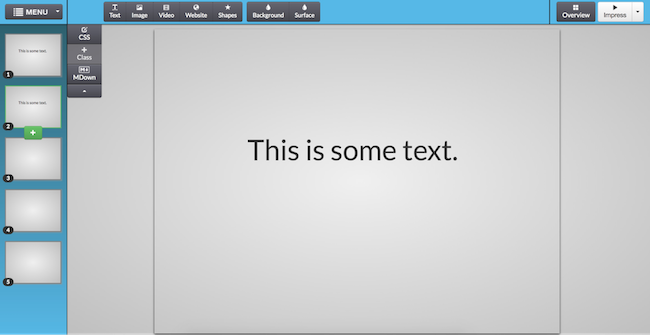 The animation tool is a tad basic for my liking, especially considering that it’s primarily text-based. An interesting concept and something I can see being used by some people though I’d probably opt for the animation tools in Keynote or Google Slides to achieve the same result. This is a much more practical video tool, and one that many marketers will likely find valuable. One thing that confused me about this one, however, was that it gives you an embed code to use on your page instead of allowing you to directly select a page on your site. Personally, I feel that all-in-one platforms should eliminate cases like this where users are required to add elements at the code-level. Overall, it’s good to see BuilderAll thinking of video creators here, and I only hope they continue to produce more tools for this category. The ‘Apps’ module almost feels like a ‘miscellaneous’ category as it contains a bunch of tools that don’t quite fit anywhere else. That being said, many of these tools are feature-rich and could be a review by themselves, but I’d like to highlight a few of them here. Many of these resemble tools you’d plug into an existing site for extra functionality, almost like native WordPress plugins. When you consider that some of these replace the need for otherwise expensive solutions *cough* Proof, you quickly start to realize the cumulative value. From a technical standpoint, some of these tools would take a considerable level of experience to set up without using BuilderAll. A good example of this is an LMS—or learning management system—which often has to integrate with video host, membership plugin, shopping cart, and email marketing software. Of course, BuilderAll allows you to install their ‘E-Learning’ app without having to worry about any of those things. So while most of these apps (including the e-learning tool) may not rival market leaders, they do work straight out of the box which saves a ton of potentially wasted time and frustration. I’d consider that a very reasonable trade-off for the less tech-savvy entrepreneur. The ‘Webinar’ module allows you to broadcast live video to your audience. Webinars are still being used by top marketers to promote their products online, and the cost of webinar software can easily run into the 4-figures a year. As you can imagine, I was excited to see how BuilderAll’s solution compares to the likes of WebinarJam and Demio. The navigation on the side acts like a wizard, and you would need to go through each of these to fill out the required information. One thing I noticed was that this tool isn’t using “live” webinars by default. It’s something you need to enable. The other option is to use pre-recorded video and pretend that it’s live. BuilderAll even gives you some additional tools to make it look more convincing, such as “ghost users” who leave custom comments throughout. I realize this is something that breaks moral boundaries for most people, but it’s there if that’s a route you wish to take with your marketing. You can also set this up as an “on-demand” webinar, also referred to as a “just in time” webinar on other platforms. The only issue I had, and this goes back to the floating video as well, is that you need to copy codes in order to embed them into a page. Again, not a deal-breaker, but I feel they could be utilizing the integration between these tools a little better. In order to embed the webinar on a page, I used BuilderAll’s site builder to create a standalone page along with the drag-and-drop webinar element. This is what my visitors will see when they visit a page, and they can join the webinar as well as leave comments throughout. Now, in this case, I chose to do a live webinar which means nothing will actually show unless I’m doing a live broadcast. Broadcasting can be done from the webinar setup screen, and you share either your webcam or your desktop. Overall, I was as actually impressed with how capable this webinar tool is given that it’s such a small subset of a much larger product. The ‘Marketplace’ module is where you manage the money side of things, including setting up payment processors and managing affiliates. This is ties into whatever you’re selling from your BuilderAll site, whether that be digital products, consulting, live training or anything else. Recruiting affiliates to sell your products can be a powerful way to increase revenue without any upfront cost. And having the ability to do this as part of the BuilderAll suite is actually breaking the boundaries of what I thought was possible at this price point. Finally, as the name suggests, you have the BuilderAll marketplace which puts your website and products in front of the BuilderAll audience. You can also use this marketplace to find products from other BuilderAll users, and request to become an affiliate. This is a great way to find suitable offers and have them sync up with your website through the same platform. Overall, this is just scratching the surface of what’s possible through the marketplace, but it gives you an idea of the direction BuilderAll is taking here. BuildAll has 3 different pricing plans. I found it somewhat difficult to wrap my mind around what’s in each plan, since their pricing page includes so many different features for each. The cheapest is called Web Presence, and it costs $9.90 per month. It basically lets you connect 1 domain to the platform and you’ll be missing access to some of the apps. The middle tier is called their Digital Marketing plan and it’s $29.90 per month and it gives you access to all the main BuilderAll features. Finally, the most expensive plan is called Builderall Business which is $49.90 per month. You get everything from the Digital Marketing plan, plus access to a bunch of extra trainings, sales funnels and allows you to promote BuilderAll as an affiliate. Is BuilderAll the best sales funnel tool out there? No, probably not. Honestly, I feel that ClickFunnels is better in many cases. But if you can’t afford the high price tag of ClickFunnels, then BuilderAll is still a really nice, affordable alternative. Promote the Million Dollar Challenge funnel like I’m doing and you can easily make your money back and more in just a short time. Even the highest tier BuilderAll Business plan is extremely reasonable, so it can definitely fit within any budget. And it’s much, much cheaper than getting access to all these tools separately. If that sounds like you, then go ahead and give BuilderAll a try. Did our BuilderAll review get you interested in signing up for BuilderAll? Why not get some extra help to start your BuilderAll journey with these exclusive BuilderAll bonuses. By grabbing my bonuses, you will save yourself so much time and provide a ton of extra value with a minimal amount of effort on your part. I guarantee they will help you achieve better success with promoting BuilderAll as an affiliate. Take a look at my BuilderAll bonus page for more details on the above bonuses and how to get them. Affiliate Disclaimer: I hope you enjoyed our BuilderAll review. Please note that some of the links inside this article may be affiliate links for BuilderAll. That means that if you click on one of the links and sign up, we may get an affiliate commission for it. If you do happen to click, we really appreciate it! Any money we make keeps this site running smoothly and allows us to keep producing these high-quality reviews. Hey Chris, helpful review. Just one Q: why did you strike through ConvertKit? Is Mailingboss different to ConvertKit?